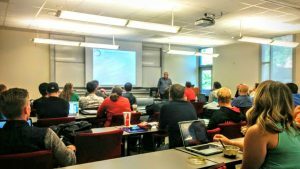 Dan teaching at Sean McDowell’s class on Youth Apologetics at Biola University. Dan is an itinerant Christian Apologist that teaches high school and college students as well as college students who are entering the field of youth ministry. He is currently teaching high school students in the Texas Hill Country and has started a Ratio Christi College Prep Chapter to bring apologetics to the local community. He teaches at his home church in Burnet, Hill Country Fellowship and has also taught at the university level on topics such as the evidence for the Resurrection, Biblical archaeology and the importance of integrating apologetics into youth curriculum to combat today’s postmodern culture. Leonora preaching at Crossroads Country Church. Leonora currently ministers to the inmates at the local county jail and state prison located in Burnet, TX. 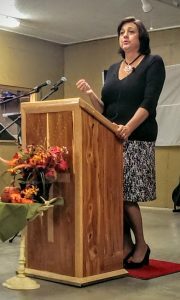 She ministers both in a group setting and one-on-one at the local jail weekly and also works with the prison to bring church services to the inmates on a frequent basis. In addition to this ministry, she also hosts a Tuesday night women’s study for local area women. This study usually consists of a time of fellowship followed by the study of the Word. Leonora teaches from her own material and others are encouraged to share lessons as well. For all of our ministry activity, please see our calendar.